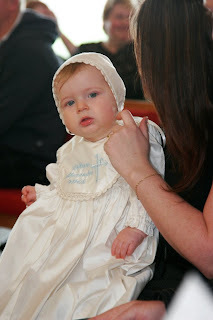 I would like to share with you photos from William's Christening Day. 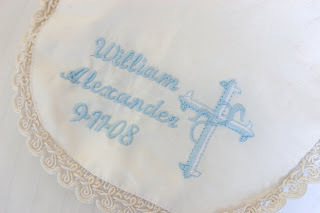 William's parents have given me permission to post them on the blog for everyone to see ! I would like to thank you both so much :) I hope you won't mind , but I have also included the emails attached to the photos ?! Sorry it has taken me so long to get this to you, but life has been busy. William looked absolutely fantastic and everyone commented on his beautiful gown! 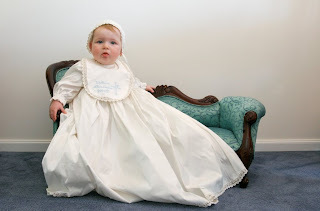 Here are some pics of the day and William in his gown. My sister is a photographer so there are some pretty nice ones there! It was a wonderful day, even if William wasn't well! 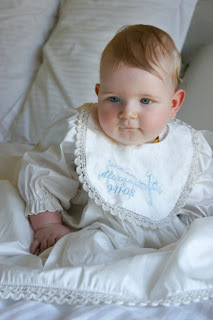 He had a viral infection and was teething! It would be good if you place the pics on your blog and I would be happy to see them there! Dawn (my Mother in law who came along) is already talking about using you again in the future and we recommend you to everyone who comments on the photos!